Imagine what it would be like if all the gardeners in your area were all aware of PlantCatching. The picture on the left would take life as the dream of being able to share perennials, bulbs, seeds and even vegetables became reality. 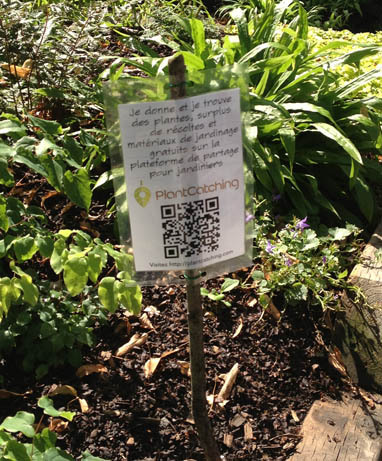 If you are proud to be a gardener who offers his plants in his neighborhood through PlantCatching, a platform you like, I encourage you to print and plant the little following label in your flower bed near the sidewalk. Optimaly, it should be coated with plastic and hanged to a wood stick. This is up to you to adapt it to your property. You may prefer to display it on a fence or against a container, Incredible Edible or not. You could even plant it outside your property, provided you are allowed to do so. This label is a simple and quick way to bring the attention of gardening passerbys, those who will next share their plants with you. Help PlantCatching be more visible around you, I count on you! You already certainly know some gardeners around you (family, friends, neighbors, colleagues). This is the time to tell them all about PlantCatching. Speak to them, send emails and ask them to do the same. Maybe you have a blog too where you could write a great post about your experience with the service. Maybe you are part of a gardening community whether it be through a virtual forum or a horticultural society with regular meetings. You can write a message there too. If you post something online, send me a link to your post so that I can participate in the discussion if applicable. If you write some web content about PlantCatching or simply mention it, please, use one or several images from the Media Kit and ensure to link back the images to plantcatching.com. As you know, an image is worth a thousand words and your visitors will have a chance to see and remember the PlantCatching visuals. 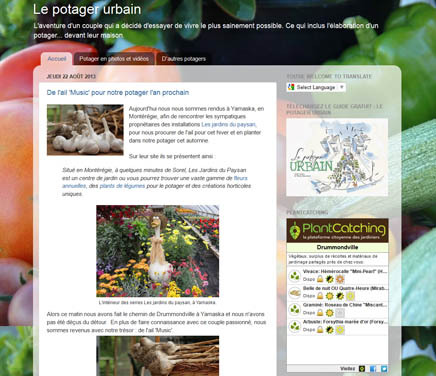 If you own a web site, especially if it talks about gardening and/or urban agriculture, I strongly invite you to display the PlantCatching widget. This is an efficient way to reveal to your visitors the existence of PlantCatching and that some plants are offered in the area you have chosen to represent. To create the widget code snippet, you need an account, then visit this page. 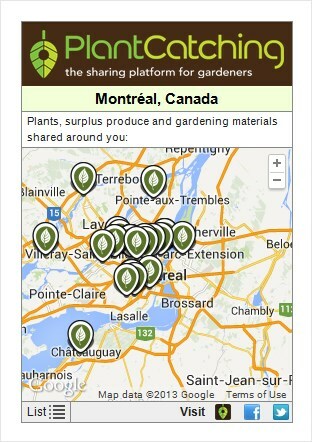 If you are an organization working in horticulture or urban agriculture, somewhere in the Montreal area, you can invite me to give a conference (in french) to a group of gardeners. I will gladly visit you and talk about the PlantCatching story, how it works, and its future. Contact me to organize it. I can send you some flyers if you own any type of Bamboo account or if you supported PlantCatching by a donation, whether you are an individual looking to distribute them, or an organization working in horticultural or urban agricultural sectors and have the ability to reach many gardeners in your community. Just give me a call or send me an email with your address, along with a message explaining your intentions. Quantities are limited, so please only request them if you intend to use them wisely. 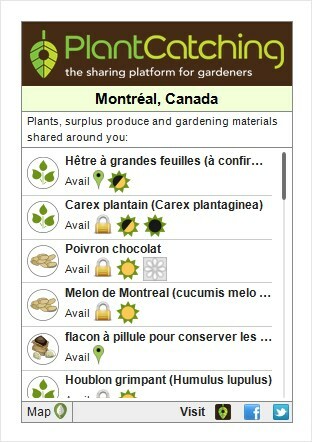 On Facebook, you can share and like PlantCatching's communications or spread the word in your own way. Either way, please use the #PlantCatching, #Gardening, #VegetableGarden hashtags or any appropriate variations. On twitter, you can retweet PlantCatching's tweets or write whatever you want on the subject. If you are donating a plant or if you are finding one in your neighborhood, why not take a picture and share it on your favorite photo sharing site? Don't forget to put a direct link to PlantCatching's homepage. That's all it takes: you will have helped a lot! You certainly have some mature plants to divide or one plant that you would like to replace with something new, so one of the first things you should do is donate a plant (it could be a seed packet too). Attach the label to the plant and release it in public mode just in front of your house. That way, a passerby will take it, hopefully read about PlantCatching and be inspired to release a plant too. If he does the same thing, and the next person does it too, PlantCatching might get known quickly in your area.